We are one of the leading firm engaged in the manufacturing, exporting of high-quality Heat Exchanger, which are manufactured using very high-quality raw material procured from the most reliable vendors of the industry. The Heat Exchanger provided by uses water or air as coolant media and reduces the moisture & oil load coming on down stream at the initial stage. The product is easy to use and is widely demanded its high performance and reasonable rates. Every product is manufactured under the surveillance of our expert professionals and is designed by our specialist designers keeping in mind the latest market trends. 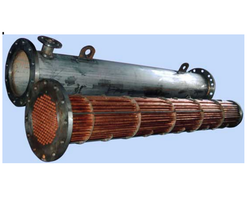 We are one of the eminent manufacturers of high-quality Heat Exchanger. The heat exchanger substantially reduces the moisture & oil load coming on downstream at the initial stage. The cooling medium can be water or air. It is designed for accurate and trouble-free service. They are quality checked on various parameters to ensure high quality of the product. It is available at very reasonable rates to our clients and is delivered within the time promised.